Susanna Leonard Hill is hosting a picture prompt at her site. I am a sucker for dragons, so I had to give it a shot. Moats were pretty common in the land, but this river of fire was overkill. The dragon's red hot scales and sharp horns were frightening enough. His snake eyes followed me as I searched for a place to jump to the castle. I could see the captured maiden over the tips of the flames. She was pretty, but not the fairest of them all. Princess Gwen's gold hair dangled to her knees, and I only had to save her from a single ogre. I battled trolls with foul-smelling warts to rescue Princess Amelia, and you could see the ocean waves in her eyes. This maiden focused on her knitting. When she finally noticed me, she sprang to the window and said "oh help me brave knight." After a moment she returned to her work. I supposed I should save her from the dragon, but she seemed calm enough. The dragon moved, and I noticed a boy peeking out behind him. The dragon's lips curled up in a wicked smirk. My horse reared up to run, and she was never wrong. Sayonara, fair maiden. "Did you see that?" the maiden yelled to her brother. "That knight just turned and ran the other way!" "You could try brushing your hair every once in a while," her brother yelled back rubbing the dragon's empty belly. 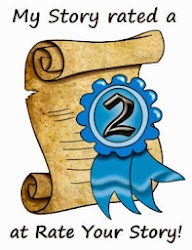 Please stop over to Susanna's site to read the great entries! Aw...an unkempt princess! Very creative and fun! Isn't it amazing how many different stories grew from one picture? I love your idea spawning from the tiny key at the top- and rhythm and rhyme in a few days time? This is fabulous, Lauri! Very fun! 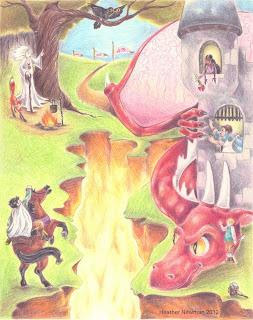 I love that the maiden and her brother had lured the knight in to feed their dragon - very creative and original! :) Thanks so much for entering, and I'm glad to "meet" you and see your blog! Thanks for hosting the contest Susanna - I wish I had caught the series earlier in the summer. If you plan to repeat, it is on my to do list for next year. I am updating my calendar for Mondays immediately! Hi Lauri...so lovely to connect with you via Susanna's wonderful contest! Great story...I love how your characters are portrayed in such a modern way...the princess more interested in her career (knitting) than in the knight. Fun story, Lauri! I loved the last line, "You could try brushing you hair every once in a while." LOL! Thanks Romelle. I must have looked in the mirror for a moment when I was trying to figure out the ending :) Congrats on completing the prompts all summer! I'll have to be on the look out for this next year. Really great contest! Is this something anyone can participate or is there a linky list, or just some friends putting it together? *Hi* to you Ink in the Book! (Do you share your real name or are you mysterious?) Anyhow, I jotted down a few things and I probably have a whole blog post here so don't be surprised when you see one down the road. http://taralazar.wordpress.com - Tara Lazar hosts PiBoIdMo (Picture Book Idea Month)in November. http://www.writingforchildrenandteens.com/ - Cynthea Liu hosts Red Light Green Light contests throughout the year. http://writeoncon.com/ - An online conference in August with a forum for critique with roaming Ninja Agents and virtual presentations. Fantabulous. http://kathytemean.wordpress.com/ - Kathy Temean hosts a monthly picture prompt with critiques from agents and editors. http://paulayoo.com/napi/ - Paula Yoo hosts NaPiBoWriWee, a contest to write 7 picture books in 7 days (first week in May). Exhausting but amazing. http://robertleebrewer.blogspot.com/ - Robert Lee Brewer hosted an April Platform Challenge covering blogging, social media, and everything about creating an author platform. He may repeat in 2013.
http://christiewrightwild.blogspot.com/p/contest.html - Christie Wright Wild does a quarterly PB contest to win a free critique. http://susannahill.blogspot.com/ - Susanna Hill has contests throughout the year.